Property Size 1,300 sq. 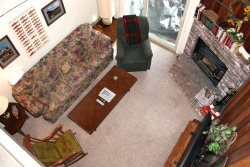 ft.
Standard Unit, 2 Bedroom & Loft & Three Bath Town home in the Scenic Meadow area of Mammoth Lakes. Sleeps up to 8 (approx.1300 sq. Ft.). You enter the unit on the first floor which has both bedrooms and 2 full bathrooms, the second floor is the living room, kitchen, dining room and 3rd full bath. The Living Room has a Lane Reclining Sofa & Reclining Love Seat and 40" Flat Screen TV. The third floor is the loft (open into the living room by a half wall). Each bedroom has 1 queen bed, and the loft has 1 queen bed, 1 full bed & 1 twin bed. 4 flat screen TVs (Living Room, Each Bedroom and Loft), VCR/ DVD, stereo & Wireless Internet Access. Washer/Dryer in unit. Great Views from the living room deck. Cabin Style decor. New dishwasher and stove installed December 2013. No phone in unit. Although this is not a pet friendly rental, the owners do bring their own dogs to the unit. There are a maximum of two outdoor parking spaces available. Snowflower Features a Hot Spa and Sauna, Summer Time Only Swimming Pool, Tennis Court, and On-Site Laundry. There are No Motorhomes, Trailers or any type of Towed Vehicles allowed on the Snowflower property. COMPLIMENTARY INTERNET and CABLE TV are provided, however NO REFUNDS will be given for connectivity problems or Internet failure. TOT LICENSE 807-SF13.